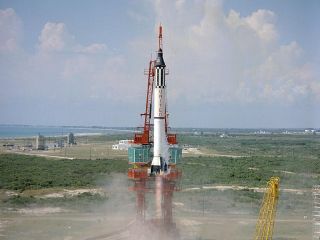 The Redstone booster carrying Mercury astronaut Alan B. Shepard, Jr. lifts off from Cape Canaveral at 9:34 a.m. Eastern on May 5, 1961. His 15 minute sub-orbital flight lifted him to an altitude of over 116 miles and a maximum speed of 5,134 miles per hour. Shepard had become the first American in space. Fifty years ago today, America sent its first man to space. Now, after half a century of mounting achievements, the United States faces a crossroads on its future in space. Alan Shepard flew in space on May 5, 1961, the first American to do so. He launched aboard a Mercury-Redstone 3 rocket named Freedom 7. The suborbital flight lasted 15 minutes. Although Soviet cosmonaut Yuri Gagarin had beaten him to space about three weeks earlier, Shepard nonetheless made history as the first American to reach space. Finally, the United States built the space shuttle, the most versatile spacecraft ever to fly. Though the shuttle program suffered the withering losses of the shuttles Challenger and Columbia and their crews, the orbiters achieved many firsts and were vital to building the International Space Station, the largest man-made structure ever put in space. "All good things must come to an end," said Phil McAlister, acting director of Commercial Spaceflight Development at NASA headquarters in Washington, D.C., speaking at a news conference last week. "I believe the shuttle is an inherent part of the pride we all feel as Americans. While we are ending the space shuttle program, we are not ending the nation's human spaceflight program." In place of the space shuttles, NASA plans to use commercially built spaceships to get astronauts to low-Earth orbit, where the International Space Station is, in the future. None of these vehicles are yet built, but the space agency aims to spur them on through a series of contracts under the so-called Commercial Crew Development program. Four companies -- SpaceX, Blue Origin, Sierra Nevada Corp. and Boeing -- recently won deals as part of the program to work on building their own spacecraft capable of carrying humans to low-Earth orbit. "There are many challenges ahead and success is not assured," McAlister said. "But the benefits of this new approach are clear and compelling. The commercial crew program is the nation's primary strategy for ending the gap and eliminating the threat to America's leadership in space." This plan was promoted by President Obama, who canceled the previous administration's moon-bound Constellation program. The move has garnered resistance from some, who question turning over any part of the U.S. space program to the private industry. Yet NASA leaders insist the change is necessary for the country to move on in space. An early morning scene at the Kennedy Space Center's Launch Complex 39, with the space shuttle Columbia in position on Pad 39A at right in March 1981. The shuttle launched into space on April 12, 1981. While NASA outsources travel to low-Earth orbit to the private sector, the U.S. space agency plans to focus its money and energies on developing the spacecraft and technology necessary for journeys to an asteroid and to Mars. "I think in 50 years I would be very surprised if we hadn't landed on another planet, either the moon or Mars, or headed toward an asteroid," astronaut Greg H. Johnson, pilot of the space shuttle Endeavour's upcoming STS-134 mission, said in a NASA interview. And where Alan Shepard's flight took place in an atmosphere of fierce international rivalry between the United States and the Soviet Union, today's spacefarers are working together. The International Space Station is a collaboration between the United States, Russia, Japan, Canada and Europe. Future space exploration is likely to be even more of a cooperative effort, many say. "I think what we’re going to see from the space program in the next 50 years is us coming closer and closer together as a species, coming closer together to solve a lot of the challenges and problems that we have on this planet," said astronaut Ron Garan, who is currently living and working on the space station as part of Expedition 27. "Hopefully, we’ll have many people living and working in space in the next 50 years."